Very high bond, double sided, tape bonds permanently to virtually any substrate. High performance, consistent surface adhesion provides stress-free bonding that outlasts traditional fasteners. High bond tape won’t rust, age, or wear and actually continues building adhesive strength over time. Unlike mechanical fasteners that require tools and labor, high bond SilverTape® is easy to peel and stick. Just apply pressure along the full length of the tape and let it set, or “wet out” for 72 hours to reach full bond strength. While a primer is not required, it will help to speed up adhesion. SilverTape® is available as rolls or spools of tape, as well as custom cut parts for production line processes and after market applications. 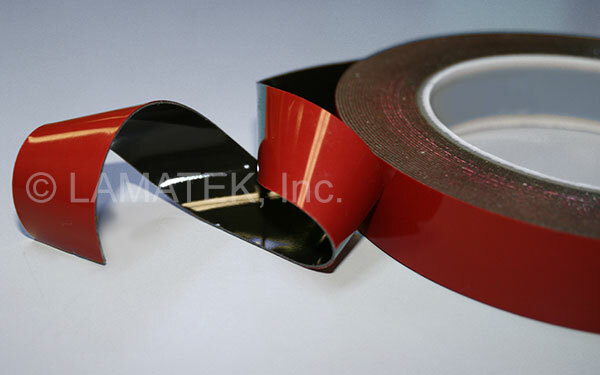 High bond tapes are self wound with a signature red liner on one side while gaskets and cut parts are supplied kiss-cut on a roll with red, peel away backing on the exposed side. Through and through adhesive makes high performance SilverTape® virtually indestructible against wind, water, high impact, shock and other environmental effects. Tapes are available in black, gray, white, and optically clear for a clean appearance. Mechanical fasteners can wear out or rust over time from corrosion, friction and stress caused by weather, vibrations, and stress. Our durable, long-lasting tape saves time and money by eliminating unnecessary labor and the need for replacements in the future. Apply our tape only once and you’re set for life. © 2019 LAMATEK, Inc. All rights reserved. Please enter the (approximate) date by which you'll be needing the finished product(s). No, please contact me to discuss. I don't know, please contact me to discuss. What kind of surface or substrate are you sticking it to? LAMATEK never shares proprietary information but we will gladly sign an NDA to protect you and keep your information confidential. Also, if you'd rather not say, please just enter "proprietary". Please include any other details or specs that may help us provide you with the best solution. LAMATEK never shares proprietary information but we will gladly sign an NDA to protect you and keep your information confidential. If you need pricing, please fill out an online Request for Quote here. Please enter your 10-digit phone number without any spaces, symbols, or hyphens. If you need a quote for this item, please fill out an online Request for Quote.